Houston, do we have a problem? Not a chance! 🚀 The Project page is your mission control center for staying on top of every project. Track budgets, logged hours and phase development in seconds, and see everything that's going on via your shiny new activity feed. Whether you need to monitor a specific project or juggle several simultaneously, Projects provides all the tools you need. Effectively manage resources internally while communicating project status to your clients in just a few clicks. The dashboard summarizes the project data that is most important to you. You can pin priority projects and scan your "Latest Activities" feed for a breakdown of all essential project activities. 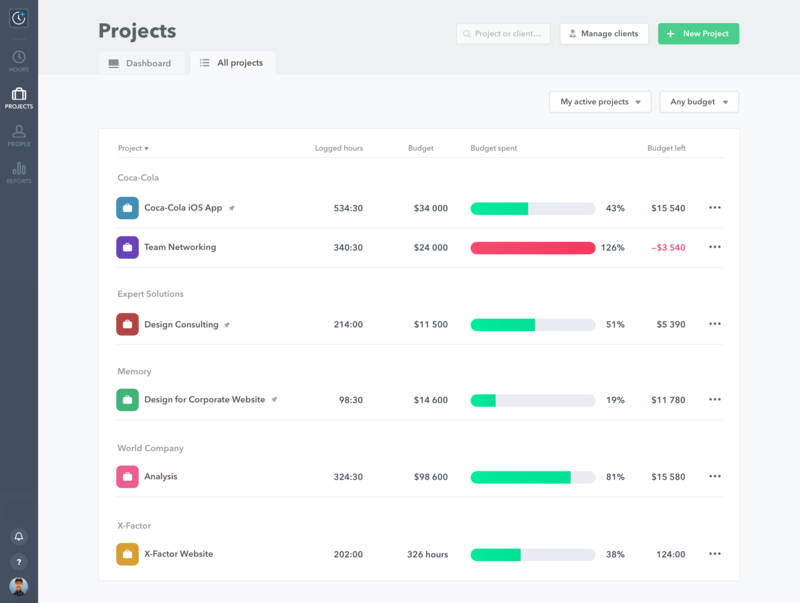 Each user has the flexibility to decide which projects matter most to them. Pinning a card locks the project to your personal dashboard for quick access to the most important information. To see more detailed information, click on a pinned card to access its dedicated project page. How do I pin a project? From the “All Projects” page, search for your Project name, click the “…” and select “Pin”! Your card will appear on your Dashboard with a pin icon in the upper right-hand corner. To unpin a project, hover over the pin to reveal the “…” and select ‘Unpin from dashboard’. Scrolling down on the Projects home page reveals your "Latest Activities" log detailing budget use and other important recent project activity. This live feed is designed to keep Admin and Normal users in the loop on project status updates as they happen. You were added to <Project Name>. Note: Limited level users will not see all notable activities or any budget notifications. The All Projects page shows all essential data across all your projects. It's also where Admin and Normal users can manage clients, add new projects, see archived projects and edit projects. Limited level users will only see projects they were added to and will not see monetary values for budget progress. Can’t find a project by scrolling through the list? Use the search button to auto-populate project names for quick access to the project’s Hours page. Clicking the project name in the drop-down will redirect you to the individual project page. The default view will show projects with any budget. Click the drop-down to filter for billable and non-billable projects only. Seeing billable projects only gives you a breakdown of all the projects bringing money in to you or your company. Filtering for non-billable projects will help you understand how much time you’re spending on administrative tasks. I’m an Admin. How do I just see the projects I’m working on? Admins and Normal users are able to view all active projects, company-wide. To view projects only you are assigned to, click the drop-down and switch to “My Projects”. This drop-down also lets you to see all archived projects for accessing completed projects. Note: Limited users will only be able to see the names of projects they are assigned to. Click a project name in the dashboard or a Project name in ‘All Projects’ to go to its individual page. From here you can access more detailed information on status and user activity, and even generate a project report!